Stampin’ Up! Frosted Fun-Fold Sneak Peek! Happy Sunday, y’all! Hope you’re enjoying your weekend! And – I hope you have a hankering for a video tonight! I’ll be live on my Stamps-N-Lingers FB page tonight at 8pm eastern, so join me if you can! We’re going to do a fun-fold…and for the sneak peek, I used the new Frosted Floral Specialty DSP. Take a sneaky peek! Days to the 2018 Holiday Catalog! To create the exclusive Dashing Along Designer Series Paper, Stampin’ Up! decided to use a mix of old favorites and new patterns to bring you beautiful, traditional Christmas paper. This collection of patterns has an eclectic feel and is perfect for layering, and while the newsprint design isn’t Christmas-themed, we selected it for its versatility and popularity. I hope you’ll love this Designer Series Paper as much as I do, and remember, it’s available for a limited time only! Stamps-N-Lingers 2018 Holiday Catalog Shares Are Still Open! Everybody likes to play hide-and-seek. And on a completely different note – I took these pictures over my barn the other evening. God-Light…brought to you by iPhoneX!! Stampin’ Up! Joyous Dashing Deer Sneak Peek Fun Fold! Well – I made a dent in my crafting spot yesterday. Sorta got distracted by alphabetizing all my stamps and getting them back in their spot. And rainbow-izing my Stampin’ Blends. Don’t judge – these are very important organizing necessities! The layout for the front of my easel is from this week’s MFT Wednesday Sketch Challenge! And – since it’s a Fun Fold…so I played along with the Paper Craft Crew Challenge! Finally – I’m pretty sure Christmas is an “Occasion”, so….boom – playing along with Helen at the Watercooler Wednesday Challenge! This is one of my favorite fun-folds, and it’s so darned easy! I started with a piece of Gray Granite card stock, cut to 4 1/4″ x 11″ – and I scored and folded it at 5 1/2″ and then again at 8 3/8″ – to make the easel card base. For the card front, I used my Pretty Pines pine bough and pinecone dies, and the new Big Shot Embossing Pads, to emboss a Whisper White panel with pine-y goodness. Then I adhered the panel to a Tranquil Tide mat with Liquid Glue. I cut a piece of Joyous Noel Specialty DSP and matted it on Tranquil Tide, then adhered it to the card front with Liquid Glue. For the art, I cut a Stitched Shapes Framelits circle and embossed it in the Pinewood Planks Dynamic TIEF, then popped it onto the card front with Stampin’ Dimensionals. The Detailed Deer is cut from a piece of Copper paper in the new Joyous Noel 6″ x 6″ Glimmer Paper – then I stuck him on the embossed circle with Liquid Glue. I stamped the Dashing Deer sentiment in Merry Merlot onto a piece of Whisper White and cut it out with the label die in the new Night Owl Thinlits (coming on 5 Sept in the Holiday Catalog). Then I used a little Liquid Glue under the left end and a Stampin’ Dimensional on the right side to adhere it. See how I so cleverly tucked the sentiment under the deer’s front leg? While I had the Night Owl Thinlits out, I cut a bunch of snowflake-y stars out of the Merry Merlot Joyous Noel 6″ x 6″ Glimmer Paper and adhered them with Liquid Glue hither and thither about the card front – and that was it! I made the easel “stop” by matting a little more Joyous Noel Specialty DSP on Tranquil Tide and adhering it to a Whisper White panel. I colored a new Festive Farmhouse Elements by pressing it into my Merry Merlot ink pad, then I adhered it to the DSP strip with Liquid Glue. I stamped a second Dashing Deer sentiment in Merry Merlot. I used Liquid Glue to adhere the panel to a Tranquil Tide mat and into the Gray Granite card base. Then I used Liquid Glue to adhere the smaller flap of the card front to the lower part of the card front – that’s how the easel is formed! And that was it for the card! …then I added some more of the Joyous Noel Specialty DSP to the envelope flap. Et Voila! The easel fold gives what is really a basic card a whole ‘nuther level of “WOW”, does it not?! And it doesn’t hurt to have beautiful Dashing Deer and Detailed Deer leaping all about, either! Especially with the added benefit of some gorgeous Joyous Noel Specialty DSP. Hope you like! Y’all – There’s still time for Catalog Shares – but you do need to get signed up soonest! Mornin’ peeps! Know what day this is? Yes – it’s the 1st of July! Which means…the start of two awesome promotions from Stampin’ Up! The first is a super duper Joining Special! You’re going to get a whole New Ink Pad bundle when you join the team – that’s TEN FREE INK PADS – on top of the already-awesome Starter Kit! And – we’ve brought back one of our most popular promotions – the Buy-3-Get-1 Free Designer Series Paper Sale! All the deets for both of these promotions are down below – so be sure to read up, okay!? In the meantime – tonight I’ll be live on my Stamps-N-Lingers FB page at 8pm Eastern. 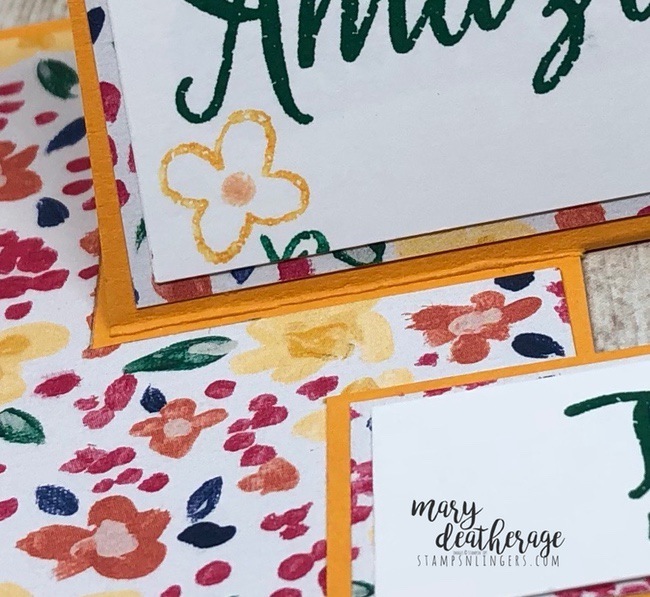 We’re going to do a fun-fold card using the so-pretty Abstract Impressions stamp set and coordinating Garden Impressions DSP (DSP…..that is on sale!). Here’s a sneaky peek! That’s pretty much all I have to say about that, okay? I really think those two words (three if you count the contraction) say it all, don’t you? Stampin’ Up! Varied Vases In Color Fun-Fold Thanks! Mornin’, y’all! Friday rolled around again! Love how it does that, don’t you? I decided to do another fun-fold for you today – one of those ones that looks totally cool (and completely “hard”) but is just a few extra folds and cuts. Good morning, y’all! It’s Tuesday so time for another Stamp Ink Paper challenge for you to play along with! This week it’s all about the fun-fold! If you were able to join me last night for my Facebook Live video, I appreciate you spending part of your Mother’s Day with me! If not – here’s a replay of the video. We made an “Impossible” card and it’s waaay easier to SEE how to do it than for me to try to TELL you! So…check it! Mornin’, peeps! Happy Mother’s Day to all the mom’s out there! Including my own! Yesterday was…busy. First took the Man to the vet for his “Wellness” check. On the way, the “Low Tire Pressure” warning came on – again. It’s been doing that for a couple of weeks and I’ve been putting air in it and hoping it would go away. No. Hope is not a valid plan. But – since I have to drive to Huntsville on Tuesday, I figured it was time to fish or cut bait. Which meant…sit and wait at the tire place while they checked to see if it could be repaired or if it would need to be replaced. It was a long afternoon. But – on a brighter note – there was a roofing nail in the tire and they patched it. So that was good news!